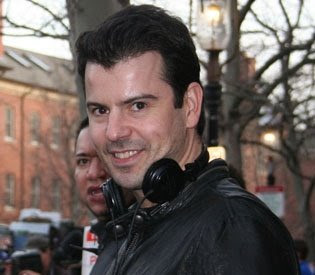 NKOTB News: Jordan visits Donnie on the set of "Bunker Hill"
Christmas came early for dozens of starry-eyed New Kids on the Block fans, who were gifted with some face time with Donnie Wahlberg and Jordan Knight on the Charlestown set of Donnie’s TNT pilot “Bunker Hill.” Jordan, who visited his bud’s Main Street shoot the other day, snapped photos with giggling gals and signed a ton of autographs. As for Donnie, he gave the female fans props for driving across the Tobin Bridge three dozen times the other morning to watch him film! “You girls are freakin’ crazy! But it’s a good kind of crazy,” the Dorchester homey yelled to his fans. Yesterday, the cameras were due to move to the Lynn Item, which is doubling as a police station for the show. New Kid Donnie Wahlberg, in town shooting a TV pilot, showed up at Sonsie with a few friends and also dined at the Union Oyster House with a lady friend. Called "Bunker Hill," the pilot for TNT filmed a scene at Joe Milano's landmark restaurant earlier in the week. Wahlberg's costar Bridget Moynahan wasted no time getting to work. Tom Brady's ex filmed a scene on Mead Street in Charlestown the other day.